Normally when I make fajitas, I make them in a skillet. I also like to call them fa-jee-tas, because I’m a weirdo. Anyway! 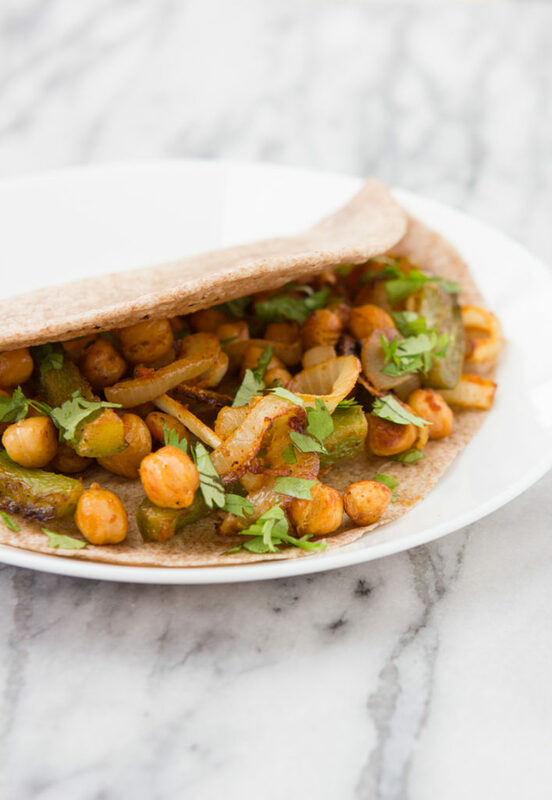 Skillet fajitas are good, but I thought I could make them even tastier by baking the filling on a sheetpan—the veggies would get nicely browned that way and, if I used chickpeas, I could get them to have a perfectly crisp exterior. Crispy chickpeas! They are the best, right? This is the part where I make the case for buying dried chickpeas. Buy dried chickpeas! I used to always buy canned beans because, hello, who wants to spend all that time cooking the dried ones? But then I read that even BPA-free cans might not be safe—the chemical used to replace BPA is kind of sketchy too. If I were just making food for myself and my husband, I probably wouldn’t think much of it, but since I’m cooking for Little Pea now, I decided to switch to dried beans.